I thin I'm finally getting used to this major chop of a haircut! I have to admit, I totally underestimated how much time and effort goes into making short hair look 'acceptable' on a daily basis ;) I tried this slick do' for an afternoon of errand running and a coffee date with the hubs. Before heading out the door I found this coat shoved in the back of our closet and forgot how much I loved it. Definitely not new to the blog, I styled this coat with a tad more pizzazz and boho flare in this post but I'm kind of loving the more relaxed vibe of ripped jeans and flats. Hope you have a great week! 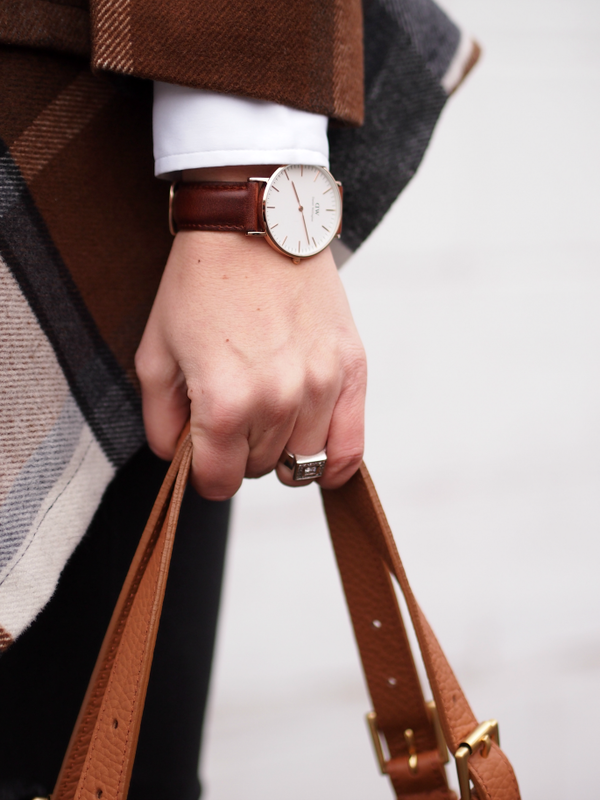 Love the earthy tones of your outfit. Loving this coat and how you styled it. Those shoes are super cute! Great outfit Krystin! And I love the new look for your blog. Beautiful! 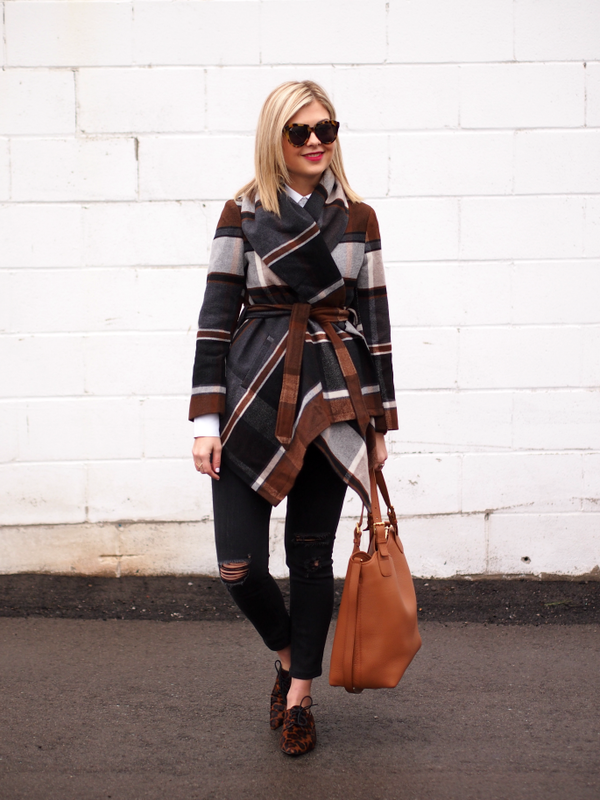 Fantastic coat and sunnies, you look so chic in this casual outfit! I love the level of classiness this look has with a spin from the shoe! love your oufit, so classy! LOVING this look. Those shoes are so so good. love the coat! Perfect for the season! Love your coat, you look stunning! This is such a great look! Love all of the browns! I absolutely love this coat. The colours and shape of it are just perfect! I love your jacket! Especially paired with that watch... perfection! I absolutely LOVE that coat. And your hair really suits you. It was a great decision! that coat is fabulous and so are those shoes! love! I have this coat and love it! What a perfect jacket! Stunning print and colours!!! Great, great, great blog redesign, Krystin. It's easy to navigate and sleek! I love this so much! The shoes and jacket are gorgeous and this further confirms my need for black distressed denim! I don't own any yet but keep seeing it and loving it more & more every time I do! Gorgeous outfit, girlie! xo! I want a jacket like this! First things first, love the wrap coat. It's the perfect blend of bold pattern, mild coloring. Now for the bag, I've been seeing this brand around on the blogs for some time now. Considering I live in NYC, one would think I would know more about it. I looked for locations near me in the Gramercy/Kips Bay area but no luck. Might has to take a little stole uptown to check them out. I'm kind a bag snob when it comes to my everything bags but I have to say, this one looks really nice. And who doesn't like monogram. You're adorable. I love this post.